At present, four genes encoding different platelet-derived growth factor chains are known: A, B, C, and D. Biologically active PDGFs exist as disulfide-bonded homodimers designated AA, BB, CC, and DD. A and B chains form a het-erodimeric PDGF AB (Fig. 1). The history of the discovery of PDGFs dates back to as early as 1974, when mitogenic activity of whole blood serum was linked to the presence of platelets . PDGF AB was the first to be purified and biochemically characterized a few years later, followed by PDGF BB and AA [2-5]. 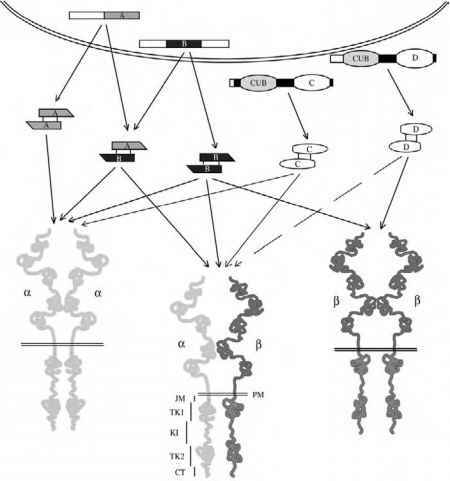 Cloning of PDGF A and B cDNAs and determination of the structure of corresponding genes were completed in the 1980s [6-8]. The newest members of the PDGF family, PDGF C and PDGF D, were found only recently by searching the database of human expressed sequences [9-12]. PDGFs C and D have a two-domain structure with an N-terminal CUB domain and C-terminal PDGF/vascular endothelial growth factor (VEGF) (core) domain, separated by a hinge region (Fig. 1). No heterodimers involving C or D chains have been detected. The unique feature of these two new PDGFs is the requirement for proteolytic cleavage of the CUB domain upon secretion in order to achieve biological activity. Thus, latency may be the reason why these growth factors were not originally detected by functional assays. Core domains of PDGF C and PDGF D have more structural similarity to each other than to PDGF A and B, sharing about 43% of identical amino acids [11,12]. PDGFs A and B are even more closely related, with 60% identity ; only 25 to 35% amino acid identity is found when A and B are compared to C and D [9,11]. Another ligand related to the PDGF/VEGF family, Pvf1, was recently discovered in Drosophila . It is 29% identical to human PDGF A and regulates migration of border cells to oocytes during oogenesis. There is evidence that at least two more proteins with PDGF motifs may exist in Drosophila. PDGFs exert their biological functions by binding to two isoforms of PDGF receptors, a and p, with different degrees of affinity. Both receptors are composed of extracellular, transmembrane, and intracellular parts. The extracellular part consists of five immunoglobulin-like domains that are involved in ligand binding (domains I—III) [15,16] and receptor dimerization (domain IV) . The intracellular kinase domain of the PDGF receptors is split in two by an approximately 100-amino-acid insert (Fig. 1) . Figure 1 Platelet-derived growth factors and their receptors. PDGFs A and B are synthesized as precursors that are proteolytically processed before secretion. PDGFs C and D are secreted in latent form and activated by proteolytic cleavage of the CUB domain. All PDGF isoforms dimerize prior to the proteolytic cleavage (not shown in the figure). Specificity of binding of mature active PDGFs to their receptors is shown; dashed arrow indicates that controversy exists with regard to the ability of PDGF DD to cause the formation of a heterodimeric receptor (reference  versus ). Domain structure of the PDGF receptor a subunit (identical to that of the P subunit) is presented. The extracellular part of the receptor consists of five Ig-like domains. PM, plasma membrane; JM, juxtamembrane domain; TK1 and TK2, proximal and distal parts of tyrosine kinase domain, respectively; KI, kinase insert; CT, carboxyl-terminal tail. PDGF A chain binds specifically to a-receptor, and PDGF B can bind both a and P receptors [19,20]. PDGF C was originally described as a ligand for PDGF a, but not P receptor ; however, later it was shown to bind PDGF P receptor in cells expressing both a and P isoforms . PDGF D has been reported to be a P receptor ligand , but its ability to bind a receptor in a/P-expressing cells remains controversial [11,12]. 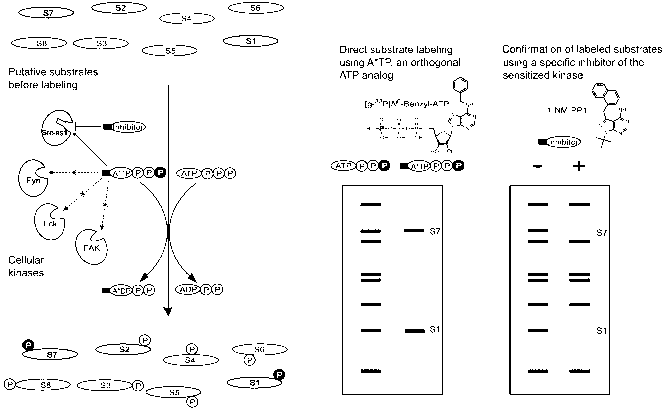 Interactions of PDGFs with a and P receptors are summarized in Fig. 1. A bivalent dimer, PDGF molecule binds to two receptor subunits, causing them to dimerize. Upon dimerization, PDGF receptors become rapidly phos-phorylated on multiple tyrosine residues. One of them (regulatory tyrosine) is located in the second part of the kinase domain and is important for receptor kinase activity (Tyr857 in P receptor  and, by homology, Tyr849 in a receptor). Most of the other phosphorylation sites lie in noncatalytic parts of the receptor (Fig. 2). The exact sequence of events during receptor activation and formation of signaling complex is unknown. By analogy to other receptor tyrosine kinases (RTKs), it seems likely that ligand binding and subsequent dimerization of the receptor induce a conformational change that facilitates transphosphorylation of regulatory tyrosine residues within the dimer. Importantly, the regulatory tyrosine lies within the activation loop, the region that is conserved among receptor tyrosine kinases . In the insulin receptor, the position of the activation loop is regulated by phosphory-lation of homologous residues Tyr 1059, 1061, and 1062 . In the nonphosphorylated state, the activation loop blocks the catalytic site, whereas upon ligand-induced phosphorylation it moves away, providing access to the substrate. It is possible that the events that follow transphosphorylation of the PDGF receptors are similar to those described for the insulin receptor, although there is no direct evidence for this in the absence of crystal structure of the PDGF receptors. Figure 2 Intracellular domains of aa and PP homodimers of the PDGF receptor. Phosphorylated tyrosine residues are shown (dark circles). Numbers indicate their positions in the human PDGF receptor sequence. Association of signaling proteins with phosphorylation sites of the activated PDGF receptors is shown by solid lines (major binding sites) or dashed lines (additional sites). Proteins binding with high affinity (e.g., PI3-kinase, PLCyl, RasGAP) occupy one or two phosphotyrosine residues on the receptor, whereas low-affinity binding (e.g., Nck, Shc, or Shb binding to P receptor) involves multiple sites. Shb was found to bind to most of the phosphorylated tyrosines on the PDGF P receptor . Fer and LMW-PTP bind to as-yet-unidentified sites on the PDGF P receptor. As discovered recently, the juxtamembrane domain of the EphB2 receptor is involved in autoinhibition of the receptor kinase. The inhibition is relieved by ligand-induced phosphorylation of juxtamembrane tyrosine residues . It is tempting to speculate that a similar regulatory mechanism exists for the PDGF P receptor, as mutation of the corresponding juxtamembrane tyrosines 579 and 581 of the PDGF P receptor inhibits PDGF-dependent activation . Interestingly, this form of regulation may not be operative in the PDGF a receptor, even though these tyrosines and surrounding amino acids are conserved. Mutation of these tyro-sine residues has little effect on the activation of the PDGF a receptor . An additional PTP-linked mechanism that is likely to contribute to receptor activation has been proposed recently. When PTP activity in cells was blocked, phosphorylation of most tyrosine residues on the monomeric PDGF P receptor was increased to the level comparable to that of ligand-stimulated receptor, showing that PTP action might contribute to keeping non-activated receptor in unphosphorylated state. In a cell-free system, ligand-bound dimerized P receptor was found to be less susceptible to dephosphorylation by PTPs than monomeric receptor, indicating that receptor dimeriza-tion might protect it from dephosphorylation by PTPs. However, phosphorylation of the regulatory tyrosine (Tyr857) was strictly dependent upon ligand binding, i.e. it could not be induced by blocking PTP activity . As known from earlier studies, catalytic activation (significant change of enzymatic parameters) of purified P receptor kinase is caused by PDGF binding and dimerization . Therefore, the initial elevation of the receptor kinase activity, which involves phosphorylation of Tyr857, appears to require PDGF-induced dimerization and changes in the receptor's tertiary structure. "Phosphatase protection" caused by receptor dimerization may contribute to maintenance of its activated (phosphorylated) state. A total of 13 tyrosine residues in the P receptor and 11 in the a receptor are phosphorylated upon PDGF stimulation [19,30]. As discussed earlier, some of these phosphorylation events may be involved in stabilizing a catalytically active conformation of the receptor. Phosphorylation of most of the tyrosines within PDGF receptors results in the creation of docking sites for a variety of proteins, many of which in turn are phosphorylated upon association with the receptors (Fig. 2) [19,20]. These proteins include enzymes (e.g., PI3-kinase, phospholipase C y1 [PLCyl], SHP-2, RasGAP, or Src family kinases [SFKs]), adaptor proteins (e.g., Grb2, Grb7, Shc, Shb, Nck, or Crk) linking the receptor to signaling proteins further downstream, or transcription factors (members of STAT family). Some enzymes may have adaptor function; for example, SHP-2 is able to recruit Grb2 via its phosphorylated C terminus . Association is mediated in most cases by SH2 domains of these proteins  and is remarkably specific, each phosphorylation site having its own binding partners. This specificity is based on the ability of SH2 domains to differentially recognize amino acid sequences following the phosphorylated tyrosine. Recruitment of other signaling molecules to the complex is facilitated by SH3, phosphotyrosine binding (PTB), or PH domains present in many of the receptor binding proteins. It is yet uncertain whether the PDGF receptor is solely responsible for phosphorylating both itself and its substrates. Because other tyrosine kinases are present in the PDGF receptor signaling complex (e.g., SFK), their involvement in phosphorylation is possible and has indeed been confirmed. Using a specific inhibitor for Src family kinases, Blake et al. showed that some proteins, including c-Cbl and protein kinase C5 (PKC5), were SFK substrates, whereas others (PLCy) were not. However, this approach leaves out other possible players (JAKs, FAKs, or yet unidentified kinases) and can be complemented by other methods. One possible strategy involves introducing a single amino acid substitution into the adenosine triphosphate (ATP) binding site of the kinase of interest so that it acquires the unique ability to bind a bulkier synthetic ATP analog. In cells depleted of regular ATP and loaded with the analog, the mutant kinase will be the only one capable of phosphorylat-ing its substrates . Figure 3 Major events initiated by the PDGF P receptor and culminating in biological responses. Upon ligand binding, activated PDGF P receptor recruits enzymes and adaptor proteins that start a number of distinct signaling pathways, some of which are shown on the figure. Note that not all of them are initiated by the same receptor dimer or in the same cell. 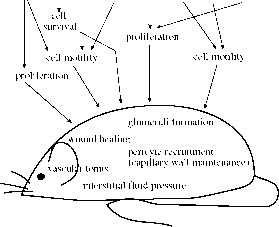 Arrows represent either physical or functional interactions along the pathways. Inhibitory effect of RasGAP is shown with -•. At present, only proteins that directly associate with the PDGF receptor and their immediate downstream effectors are best characterized. The least defined part of the signaling cascade is the one that bridges the receptor-proximal events with proteins that carry out cellular responses. PDGF is necessary but not sufficient to achieve biological effects. In a living organism, other growth factors and hormones, as well as cell-cell and cell-matrix interactions within tissues and organs are indispensable. pathways, as Ras and PI3-kinase are able to interact and activate each other [35,36]. PLCy-dependent activation of sphingosine kinase [37,38] and PKC and can also be important for motility response. RasGAP, a negative regulator of Ras, has been shown to inhibit chemotaxis . However, RasGAP has also been shown to have a positive impact on motility that is most likely independent of Ras . Another chemotaxis pathway is initiated at SFK binding sites in the juxtamembrane domain of the PDGF a receptor, as determined by mutating these tyrosines to phenylalanine residues . However, it is not yet clear whether it is Src family kinases or other signal transduction molecules binding to the same sites that are responsible for cell migration, as in triple SFK knockout cells PDGF-AA-dependent cell migration was intact . Other positive mediators of PDGF-induced cell motility include SHP-2, which can work as adaptor molecule for Grb2/Sos1, and LMW-PTP, which acts presumably by inactivating p190RhoGAP and, consequently, activating Rho and causing cytoskeletal rearrangements . In addition to chemotaxis, other PDGF-induced cellular responses include proliferation, differentiation (in certain cell types), and protection from apoptosis, as well as rapid Ca2+ fluxes and cytoskeletal rearrangements [19,20]. It is necessary to note that aa and PP homodimers of the PDGF receptor cause different, although partially overlapping, cellular responses , due to the differences in their ability to bind signaling proteins (Fig. 2). Heterodimeric a/p receptor is believed to have unique signaling properties due to altered phosphorylation pattern of both the a and P subunits [31,32].